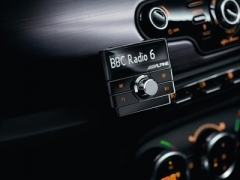 Add on DAB radio adapter which is universal for any car, connects via FM or Auxiliary in. Once installed to your vehicle you will be able to enjoy the crystal clear sound* of DAB in your car and be able to access the great content that is available only on Digital Radio, Listen to Pure DAB in car Digital radio. The sound quality and additional stations are not the only things that will enhance your driving experience as you can actually pause rewind and fast forward the radio stream that you have listened to. This is perfect for those moments when you are listening to a great radio show and then the Sat Nav or Handsfree cuts in just at the moment that the show has been building up to for ages. With the Alpine EZi-DAB you simply click the rewind button and enjoy the rest of the show a few seconds behind the live broadcast, where as with your old radio the only option you had is to shout at the sat nav, handsfree or kids for the interruption and hope to catch the moment again if the station plays it again! The standard installation includes an internal glass mounted aerial. Other external aerials are available at an additional cost, please contact us for reception advice. (*Crystal clear sound when using the AUX in installation option). Alpine EZi-DAB Add on DAB radio for any car.